Baccarat | Chicago's Pipe, Cigar & Tobacco Store | Iwan Ries & Co. This fine cigar series was formally introduced in 1978, but actually dates back as far as 1871 when it was supervised by Carl Upmann. 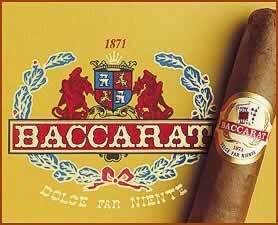 Baccarat features a sweetened head for a mildly sweet flavor and delicate aroma. This all Honduran blend consists of Kamastran Habano fillers, a Jamastran Mexican Dulce binder and a silky Jamastran Connecticut shade wrapper.